Bandicam is super fast and most effective screen recorder, image capturing and gameplay video recording software used to create video tutorials, presentations and more. A professional approach used to record anytype of tutorial, gameplay screen, image screenshots with ease and access. Every step has a keyboard shortcut key that will be used to start target operation immediately. Game capturing is an advanced technique used to publish video clips on social media as well as caught up hackers and aimbot in game. Previously, users were using Fraps for similar purposes but the video size of Fraps is too huge. So you can not upload or transfer that video because of big size. However, Bandicam will record anything with custom properties, advanced settings and easier steps. This smart and tiny software has full compatibility support for AMD Radeon, Intel Extreme Graphics or Nvidea GPU’s. The mouse cursor and fps value can be easily showen or hide upon user demands. Bandicam is able to capture through webcam, desktop screen, HDMI and gaming experience. Bandicam has added hardware acceleration for standard and latest graphic cards for smooth video recording. It can record for up to 120 FPS alongwith 4K super quality video recording. However, user can put limit on FPS overlay and FPS limitation in games. The screen capturing is so much simple where it can be saved in multiple image formats including BMP, PNG and JPEG. The most powerful feature of Bandicam is that it will reduce the size of output file without impacting the quality of video. Unless Fraps software will save a video of few seconds in GB’s. Full HD support is already available in Bandicam so you don’t worry to convert tutorials in 720p or 1080p before uploading on YouTube. Furthermore, the maximum resolution support is 3840 x 2160 with 4K Ultra HD Video recording. Moreover, it will reduce lags while playing a game, unlike other software will randomly decrease FPS rate alongwith facing huge lags. Bandicam was ranked on top of screen capturing and video recording software. The free version has a text logo on video with writing “Unregistered” but the full or registered version will fix this problem. It will keep the original quality of text, image or shapes while recording without bugs or missing problems. 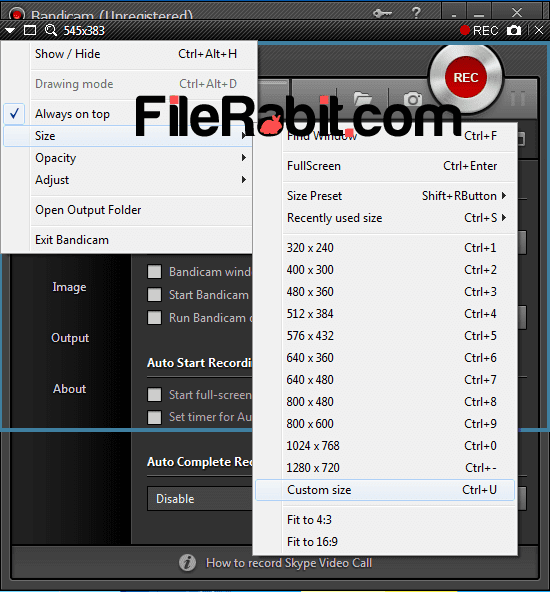 The output folder can be changed to favorite destination, change keyboard keys, quality of video and more.